Shares of Costco Wholesale hit an all-time high last Friday, ahead of next week's third-quarter earnings report. 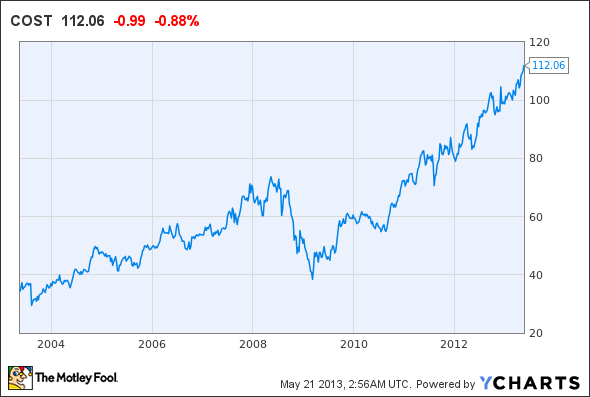 Costco stock has been a very consistent long-term winner for shareholders. Over the last 10 years, it has moved steadily higher, aside from a dip caused by the Great Recession. Costco 10 Year Price Chart, data by YCharts. Costco stock trades at 25 times earnings, so it's not exactly cheap. However, the company is still probably one of the best investments out there, because it has a powerful business model that engenders strong customer loyalty, and there is plenty of room for long-term growth. There are essentially two reasons that Costco stock has performed so well over the years. First, the company is very efficient. For example, Costco ended last quarter with inventory of just $7.6 billion, which is less than a month's worth of sales. Furthermore, this is almost entirely financed by vendors, which minimizes working capital requirements. In other words, by the time Costco has to pay its suppliers, it has already sold most of the relevant inventory. This reduces costs and allows Costco to maintain a very steady gross margin rate. Second, Costco has the lowest operating expenses in the business, due to a focus on reducing costs and "investing in price" -- i.e., lowering prices in order to drive more traffic. Last year, Costco had operating expenses of just $9.5 billion, or 9.6% of sales. By contrast, operating expenses at Amazon.com, which is generally considered a very efficient retailer, totaled 23.6% of sales. Costco's rock-bottom operating expenses give it the ability to match or beat the prices of all its competitors. This is good news for those who own Costco stock, because it means that the company should not be vulnerable to disruption by online competitors. Shareholders can be reasonably confident that Costco's industry-leading prices will be as big an attraction in 10 or 20 years as they are today. Costco is not a high-growth company anymore; revenue is growing in the high single digits, with earnings growing slightly faster. The logistical challenges of finding appropriate real estate, securing the necessary permits, and building new warehouses put a cap on growth, for all practical purposes. Costco plans to open approximately 30 new warehouses per year for the next few years, which implies 4% to 5% annual growth in square footage. However, while Costco's growth rate is modest compared to that of Amazon, it is probably sustainable for a long time. This can justify Costco stock's relatively high multiple compared to that of most of its retail peers. As of February, Costco operated 622 warehouses, of which more than 90% are located in North America. Costco continues to open new warehouses in North America, suggesting that it has not yet saturated that market. However, Europe, Asia, and Australia represent big future opportunities for the company. Costco already operates in the U.K., Japan, Korea, Taiwan, and Australia, with plenty of room for growth in all of those markets. The company is also interested in entering continental Europe, which could eventually become a large market for Costco. With all of these opportunities, the company should be able to keep growing its warehouse count by 3% to 5% annually for the next decade and beyond. Comparable-store sales should also continue to grow as Costco takes share from less-efficient competitors. This provides a road map to long-term value creation for Costco shareholders. Costco has hit upon a winning formula for long-term profit growth with its low-cost model and commitment to keeping prices low for customers. The company's cost advantages constitute a wide moat that should keep it immune to the disruption occurring elsewhere in retail. Moreover, Costco has only penetrated a small portion of its worldwide market opportunity. As a result, Costco stock seems like a bargain, even at 25 times earnings. Costco has made itself a leader in today's retail market. To learn more about Costco and another retailer with especially good prospects, take a look at The Motley Fool's special free report: "The Death of Wal-Mart: The Real Cash Kings Changing the Face of Retail." In it, you'll see how these two cash kings are able to consistently outperform and how they're planning to ride the waves of retail's changing tide. You can access it by clicking here. The article Why Costco Stock Keeps Rising originally appeared on Fool.com. Fool contributor Adam Levine-Weinberg is short shares of Amazon.com. The Motley Fool recommends Amazon.com and Costco Wholesale. The Motley Fool owns shares of Amazon.com and Costco Wholesale. Try any of our Foolish newsletter services free for 30 days. We Fools may not all hold the same opinions, but we all believe that considering a diverse range of insights makes us better investors. The Motley Fool has a disclosure policy.